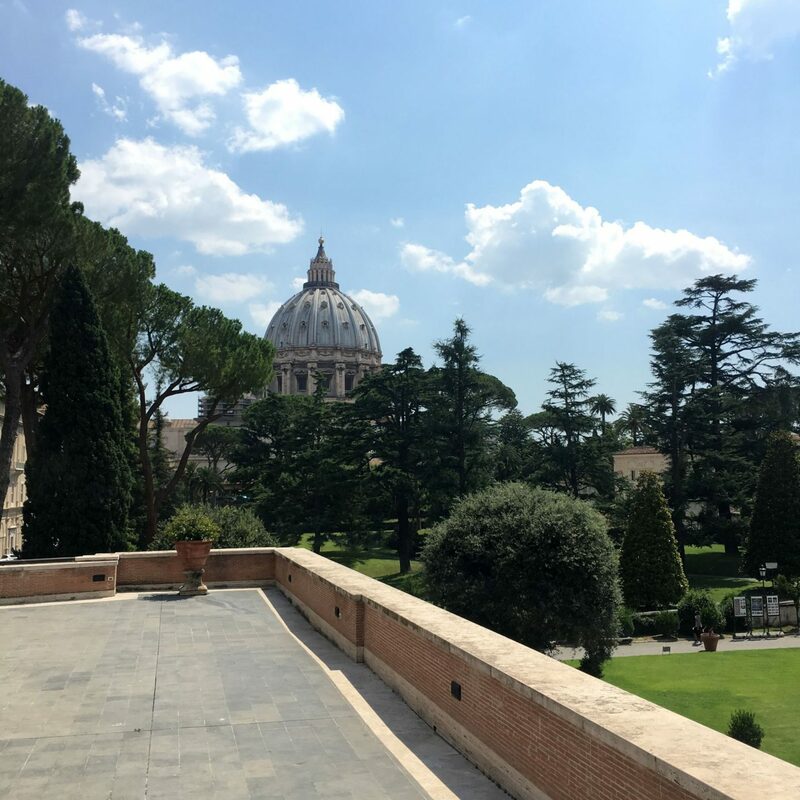 Did you know that the Vatican City is an independent state within the city of Rome? At only 110 acres and populated by 1,000 people, it’s officially the world’s smallest country. 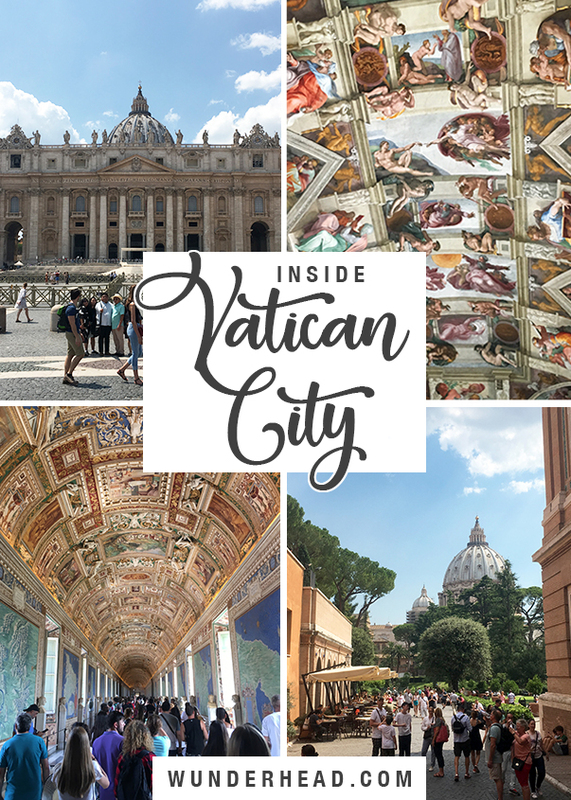 Ruled by the Pope, it houses St Peter’s Basilica, the Sistine Chapel and the Vatican Museums, featuring some of the most famous paintings and sculptures in the world. 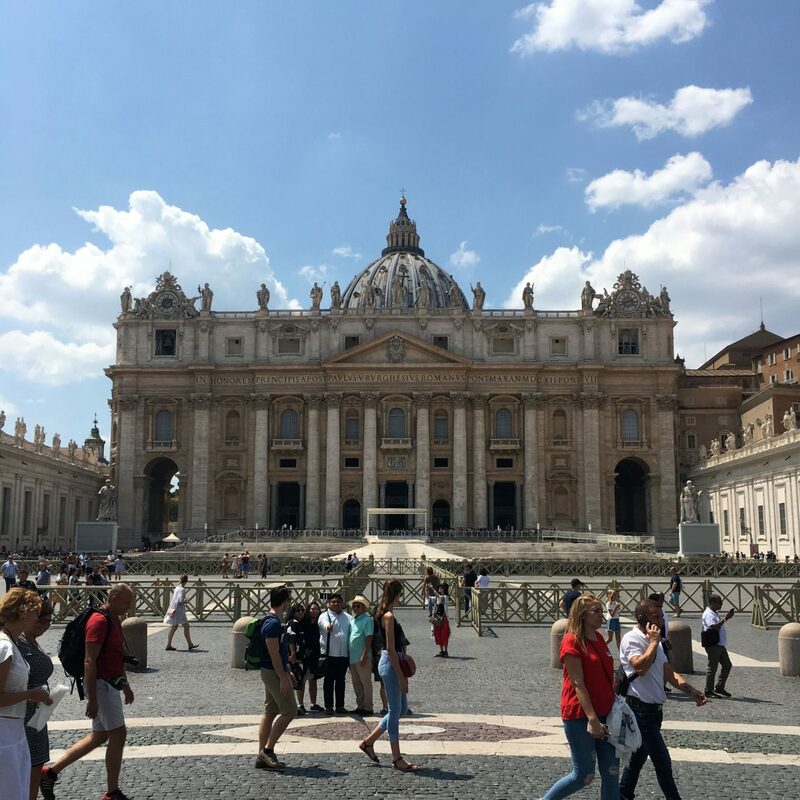 If you do it right, St Peter’s Square is your first impression of Vatican City. 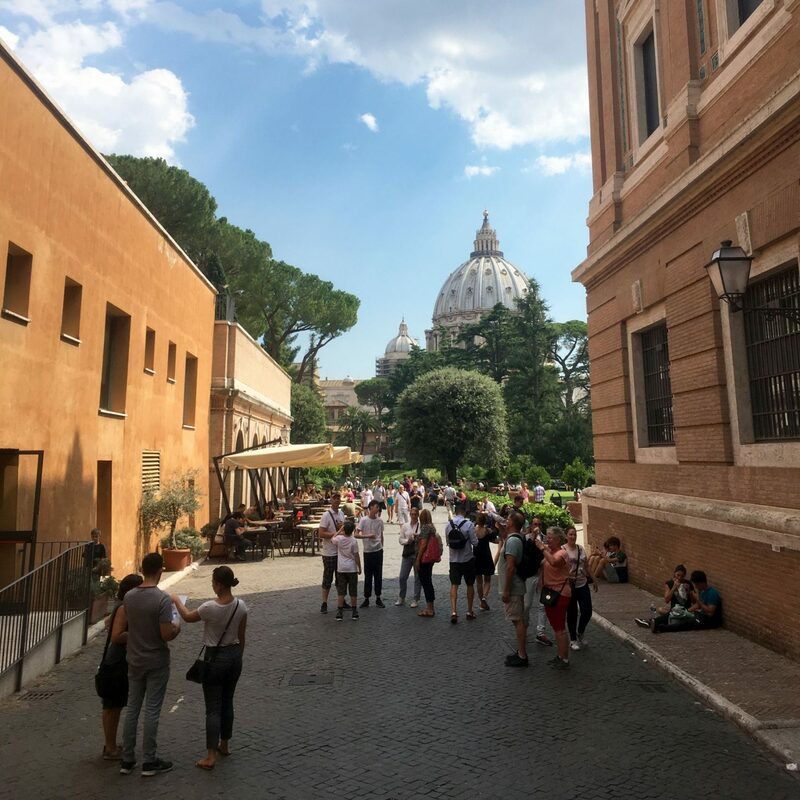 The huge square presents the facade of St Peter’s Basilica in the most dramatic way, and the best angle to approach it is down the Via della Conciliazione, where you’ll get the gradual reveal from a distance. Named after the apostle and first Catholic Pope, St Peter’s Square was designed to let the greatest number of people see il Papa give his blessing, using an unprecedented colossal scale to evoke a sense of awe. It can fit an audience of over 80,000 people for the Pope’s various liturgies throughout the year. 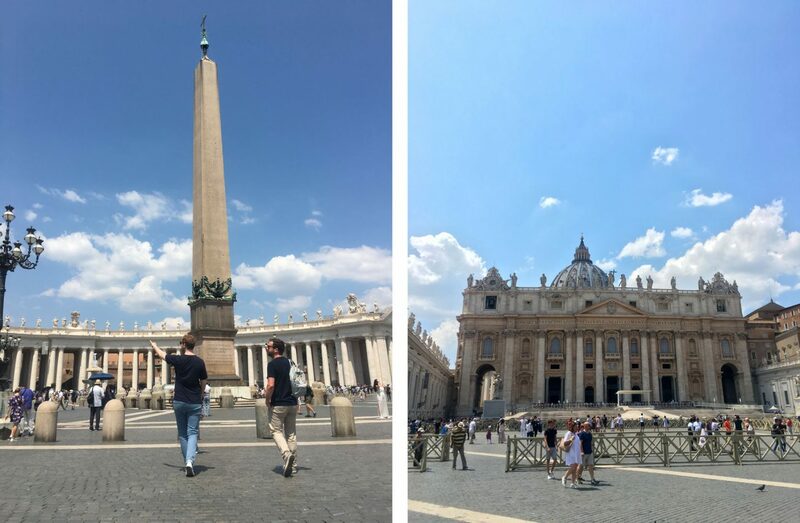 Left: The Obelisco Vaticano. Right: St Peter’s Basilica. At the centre of the square sits an ancient Egyptian obelisk, 135ft tall and originating from Heliopolis. It was moved to Rome in AD 37, where it presided over brutal gladiator combat and Christian executions. It was then transferred to St Paul’s Square in 1568, where it remains the only obelisk in the city to have not toppled since ancient Roman times. The Papal Basilica of St. Peter is the largest church in the world, and seen as one of the holiest of Catholic shrines. According to legend, St Peter himself is buried beneath the altar. Not going inside the basilica is definitely one of my biggest regrets, but quite frankly the day was just too hot and the queue was just too long. 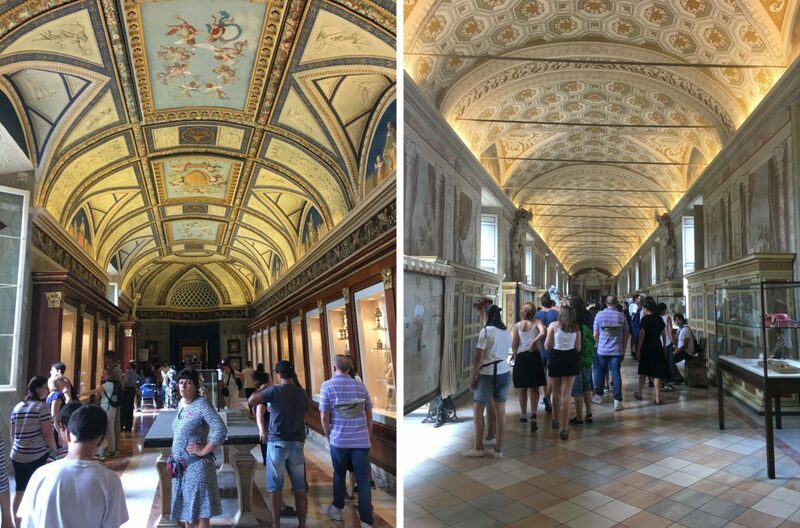 Since entrance to the basilica is free, it’s impossible to skip the queue with a ticket as you can with the museums, unless you’re part of a guided tour. Top tip! Around St Peter’s Square you will be accosted by many many tour guides trying to hook you into their guided tour. We’re not fans of guided tours, but if you want to skip the queue into the basilica this is the only way. 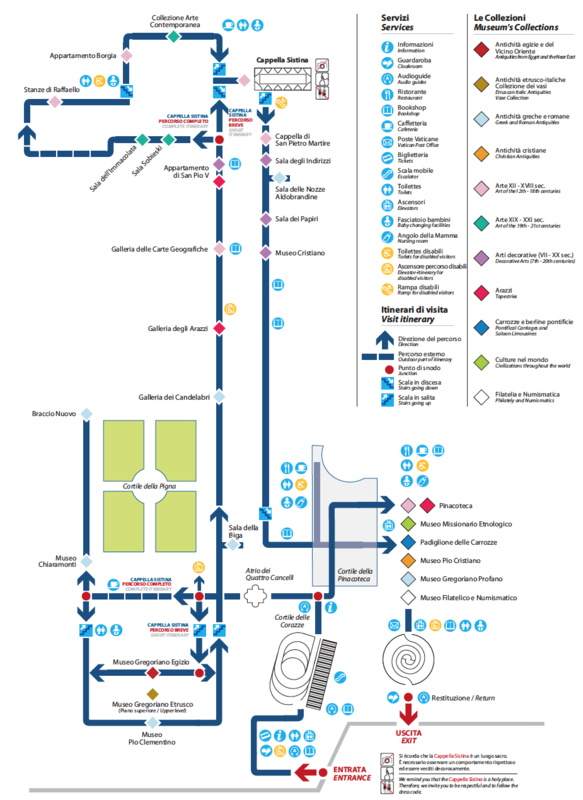 I booked our tickets for the Vatican from their official website, where you can choose from all kinds of different packages. We chose the open tour, so we could just wander around as it suited us. Inside the museums is an absolute labyrinth, with corridor after corridor of paintings, murals and religious artefacts. 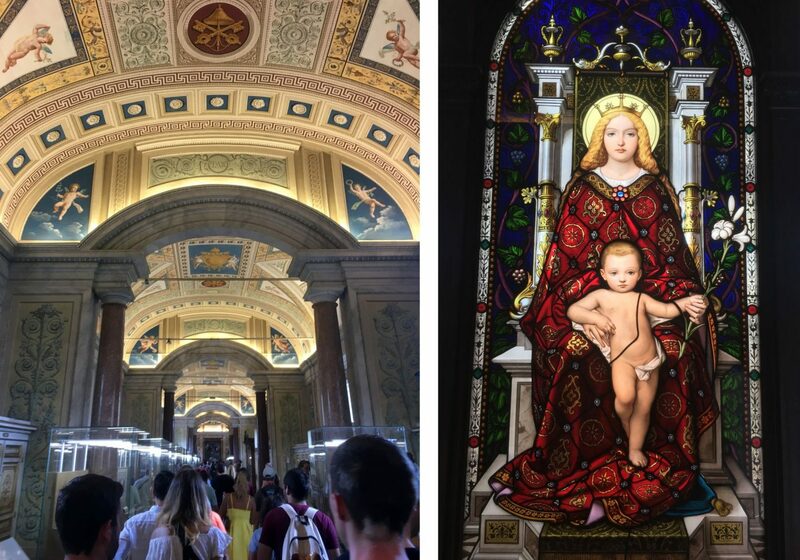 We did the Short Itinerary, skipping out the Contemporary Art Collection and going straight to the Sistine Chapel (although even the short itinerary feels like you’ve lapped the entirety of the small country). So quick tip time – if you’ve got a time booked you can skip all the queues outside the entrance, but once you’re inside, you need to pop up the stairs and get your tickets printed at one of the kiosks. Once you beep yourself through the turnstile you’re in! The view towards St Peters Basilica from the museum balcony. The first part of the museums includes the Museo Pio Clementino, Museo Chiaramonti, Museo Gregoriano Egizio and Etrusco. We glanced in the Ancient Egypt collection but decided to save our strength and move straight into the galleries. 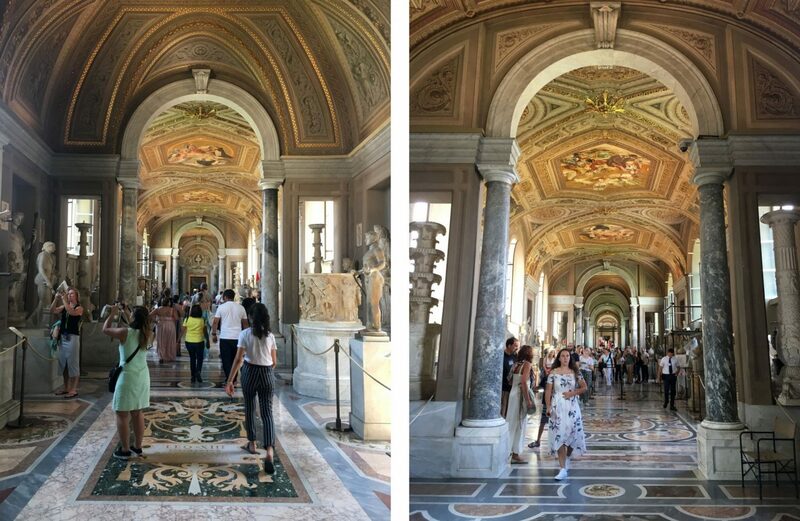 Atrio dei Quattro Cancelli, going into the first collections of the Musei Vaticani. 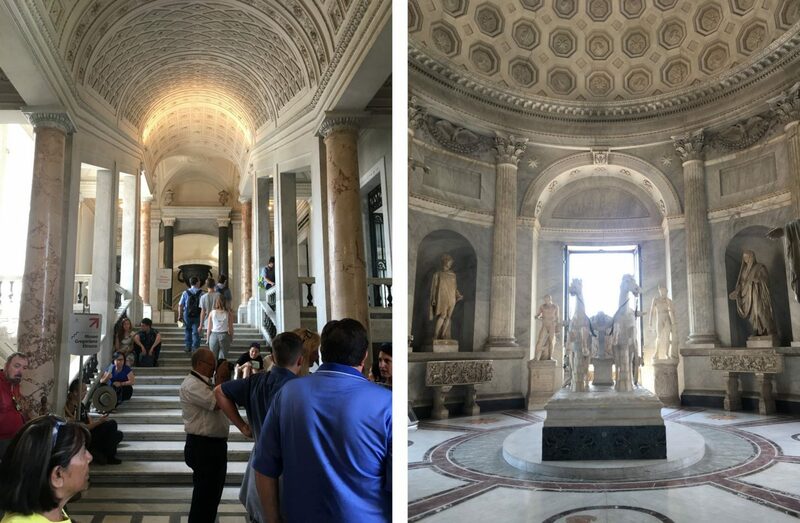 The first of three galleries leading to the Sistine Chapel, the “Gallery of the Candelabra” holds Roman sculptures of Hellenistic statues dating back to 2nd century BC. I think this is one of the most architecturally impressive galleries, with elaborate columns and archways marking the end of each section. Next up is the “Gallery of Tapestries”, where the windows are shrouded to protect the Flemish tapestries from being damaged by sunlight. The tapestries were created from drawings by Raphael’s pupils in the 16th century, and were originally hung in the Sistine Chapel before being moved to the gallery in 1838. Proudly displaying 40 maps, it’s not hard to figure out where the Gallery of Maps got its name. 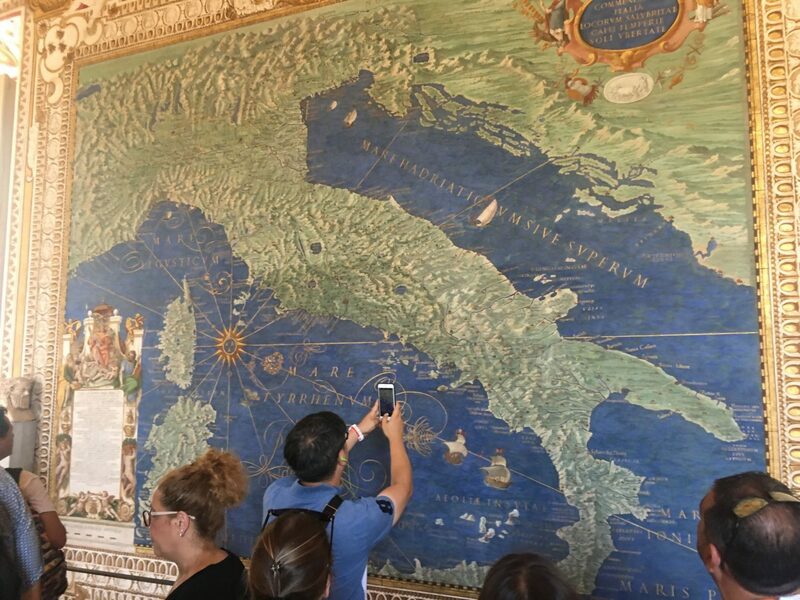 Each map shows a different Italian region at the time of Pope Gregory XIII, painted around 1580 from drawings by Ignazio Danti. 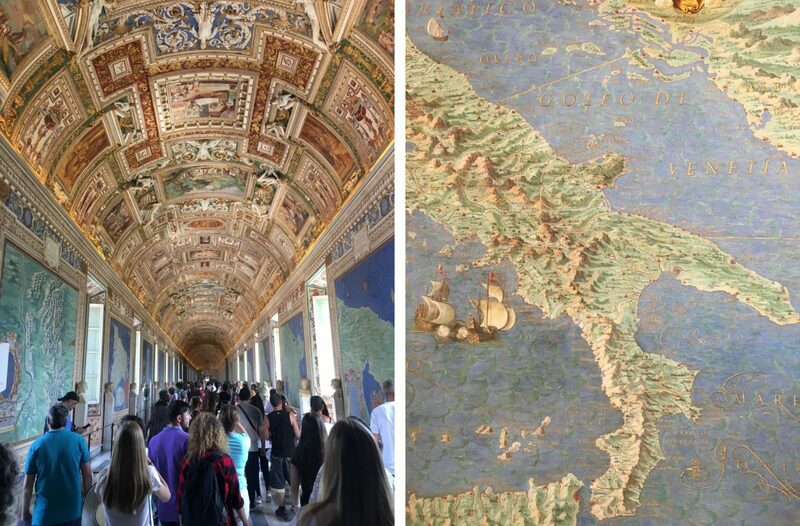 At the far end of the gallery are two maps comparing ancient and contemporary Italy. Left: The Gallery of Maps. Right: The map of Ancient Italy. The map of contemporary Italy in 1585. The Appartamento di San Pio V sits between this gallery and the Sistine Chapel, and you can follow the route around the Appartamento Borgia and Collezione Arte Contemporanea, or you can follow our cheeky shortcut by ducking under the barrier. The frescoes that we are contemplating here introduce us into the world of the contents of the Revelation. The truths of our faith speak to us here from all sides. From them human genius took its inspiration undertaking to clothe them in forms of incomparable beauty. Left: The Last Judgement. 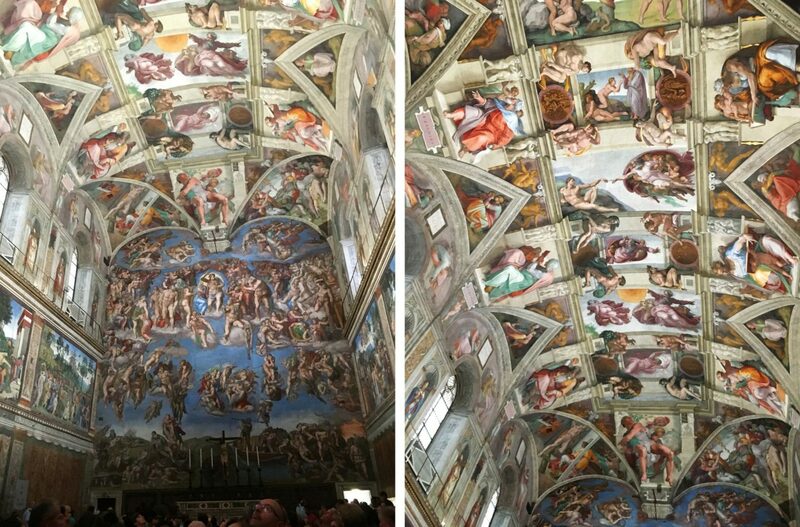 Right: Michelangelo’s ceiling frescos. Obviously the Sistine Chapel means different things to different people, but for me it’s a work of art, heavy with historical and religious significance. The walls were painted in the 15th century with depictions from the Bible and with portraits of Popes, by a team of painters including Botticelli and Rosselli. The ceiling frescos, showing the stories of Genesis from the Creation to the Noah, were famously painted by Michelangelo. One of the reasons the depiction of Adam and God in particular has become so well known is the way God is painted as straining towards Adam with all his might, while Adam by comparison lounges leisurely with his arm halfheartedly hanging in the air. 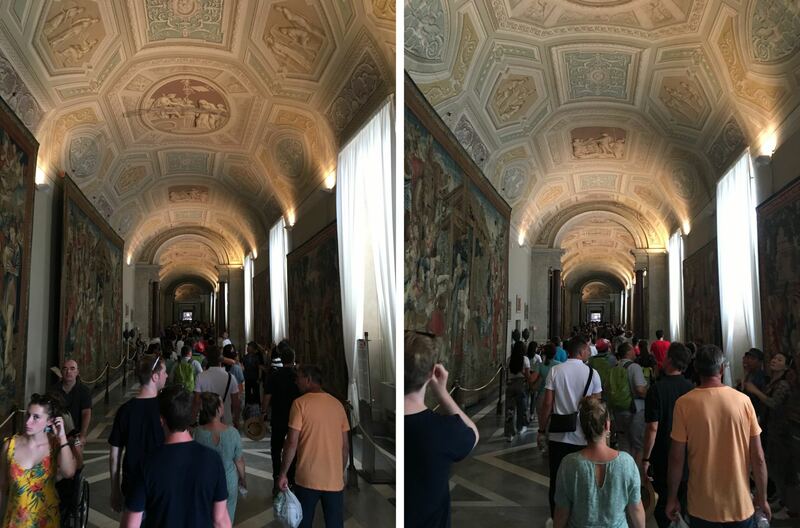 The Sistine Chapel is invariably busy but always impressive. The best way to view it amongst the crowd is to make your way to the back of the chapel, find a spot at the edge by the wall and just look up until your heart’s content. The Christian Museum, founded by Pope Pius IX in 1854, houses religious relics and pieces of Christian antiquity. The first section, the Room of Tributes, displays letters of homage to Pope Leo XIII. The long corridors focus on items found in catacombs, with the goal of shedding light on the heritage and culture of first century Christians. The cabinets in the museum are specifically designed to house and preserve these relics. The later halls of the museum also house works of art and worship of later centuries, including a rare collection of primitive Christian paintings. Throughout the museum each corridor is punctuated by gift shops where you can buy all sorts from jewellery to stationary. 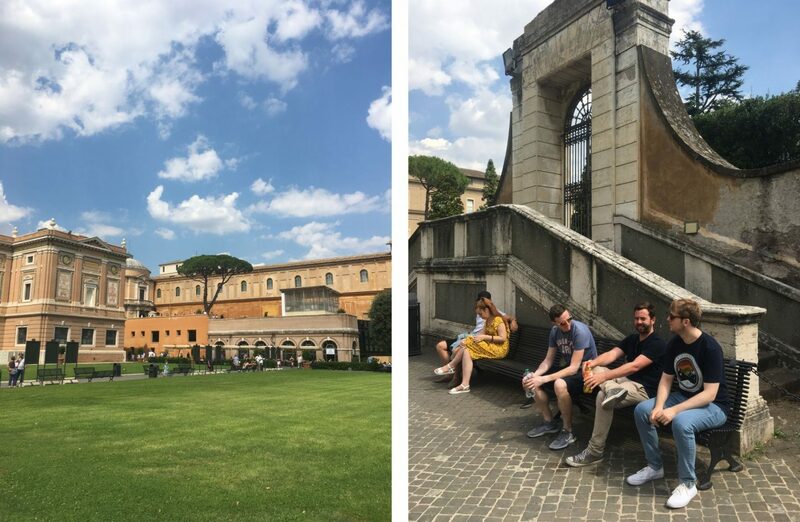 There are a few courtyards in Vatican City, including the Cortile della Pigna (named after the large bronze sculpture of a pinecone that sits at its centre) and Cortile del Belvedere which connects the Palace of Innocent VIII with the Sistine Chapel. 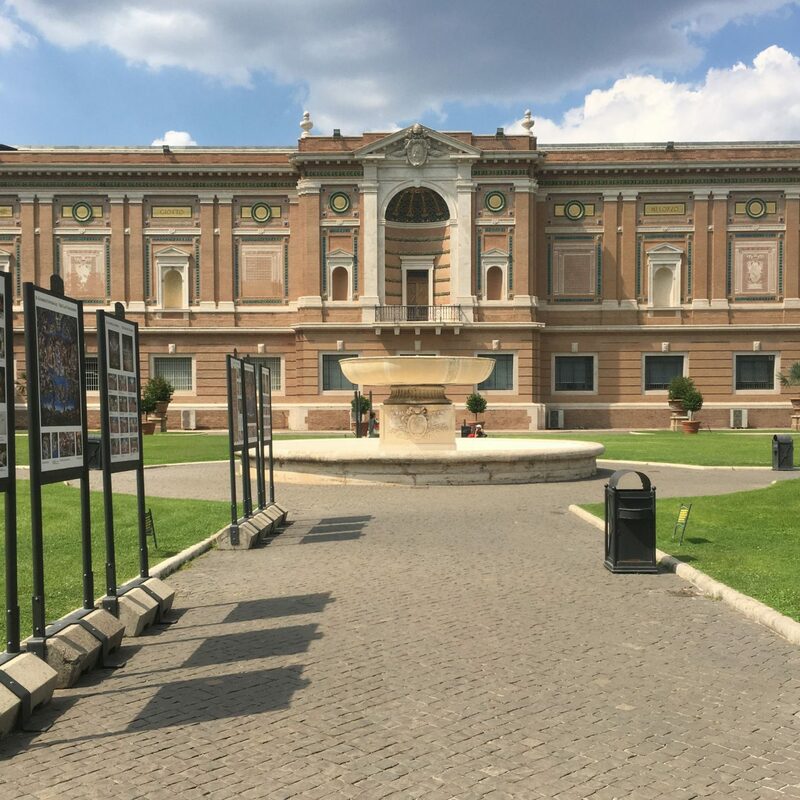 The Cortile della Pinacoteca sprawls in front of the painting gallery, or Pinoteca dei Musei Vaticani. 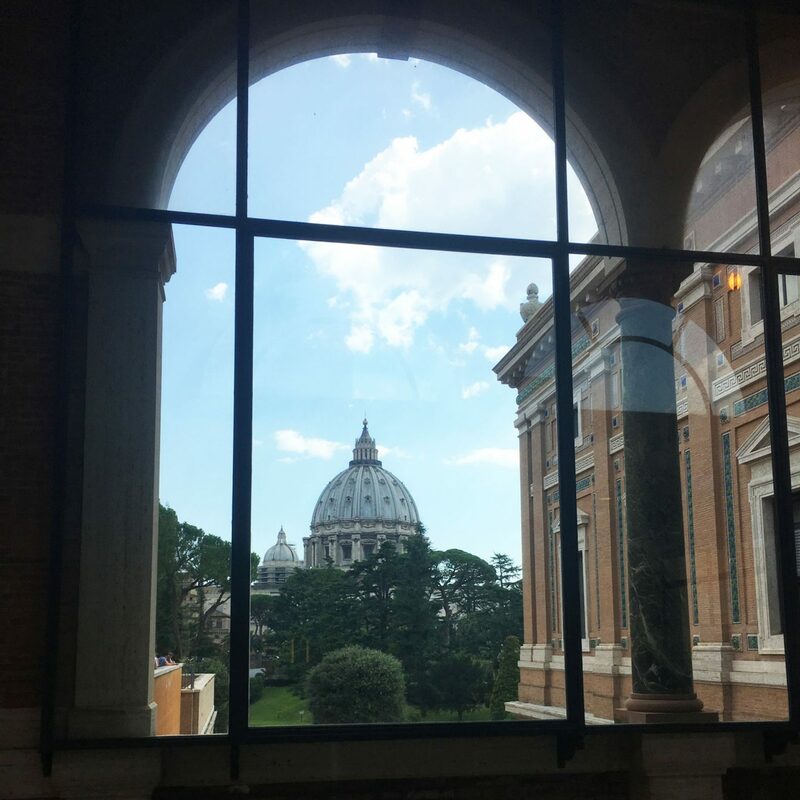 The view of the St Peters Basilica from the Vatican Museum Restaurant. The entrance/exit of the museum also has a whole bunch of restaurants, almost like a food court at a shopping mall. I would personally avoid all of these, and if you want to enjoy the museum a little longer and get some refreshment, just grab a drink and enjoy it outside under a parasol. Resting in the Cortile della Pinacoteca. The fountain in front of the Pinacoteca dei Musei Vaticani. Through the windows of the Pinacoteca. Another large moneymaker for Vatican City is the Vatican Post, where you can buy stamps or send letters to friends and family that might get some pleasure in getting post from the Vatican. It takes all sorts. Exiting the Musei Vaticani onto the Viale Vaticano. We were totally exhausted after our walk through all these hallways and corridors. I think we racked up about 10,000 steps inside the museum alone. Needless to say we needed an ice cream after all that! I recommend you head to Gelateria Fatamorgana Prati on Via Leone IV before making your way home. 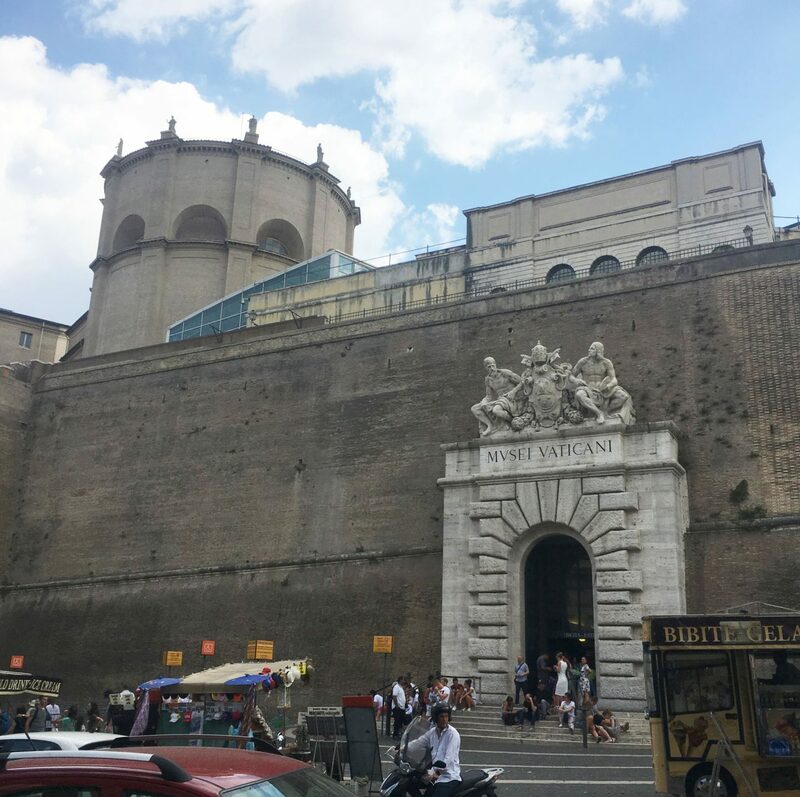 I would not recommend going to Vatican City during peak season as we did. It’s very busy, the queues are long and the sun is hot. 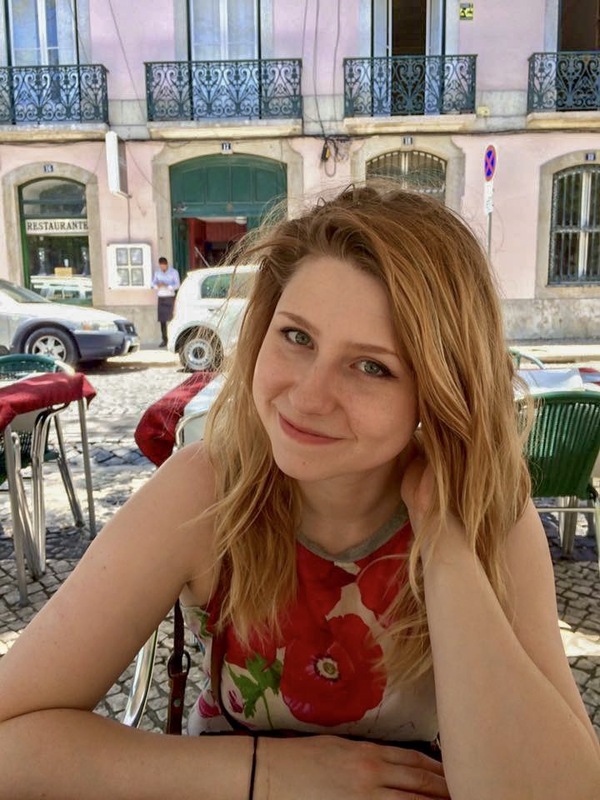 If you really want to make the most of it and be in the right frame of mind to appreciate the history, find out when the least busy times are, make sure you wear comfy shoes and do your research beforehand.